My latest novel, The Last Summer, was a long time coming. The idea first came to me during my freshman year of college, and for some reason, these characters would never quite leave. They kept pestering me. And I kept going back to the story. Until, finally, with the help of lots of coffee and diet soda and occasional boxes of Junior Mints or Starbursts, The Last Summer came to be. It’s a story about friendship most of all—close friends navigating life and love during a season of change. But over the years, as I rewrote the novel, new themes found their way into the story. While the story is in no way about me or my personal experiences, there’s no doubt that the strong theme of grace woven throughout comes from my own understanding that we all have a desperate need for grace. There’s a line in the book where my main character’s mother tells her, “We’re a broken people. That’s why the story of redemption reaches us at our core.” Because every last one of us needs grace. And sometimes we’ll need to extend it to the people in our lives, and sometimes we’ll need it given to us. Because none of us are perfect. I say things I wish I hadn’t. I make mistakes. I waste time. I get angry sometimes. Sometimes, when what we’re hoping for takes longer than we’d like, whether that’s a relationship or dream or life goal, eventually we look back over the time we spent waiting with a broader perspective. The Last Summer has been in my heart for years and years, it’s just now come to fruition. The years were worth waiting, because the story is finally what it was meant to be. It needed to come after some of my own difficult life experiences. Because that theme of grace—which was always there, maybe below the surface—needed to be developed and strengthened, as it had in my own life. Those polished characters needed a little less polish, to reflect all of us. And I hope with all my heart that the end result is a story worth mulling over, sighing over, and maybe even reaching for a second time. Brandy Bruce is a mom, a wife, a book editor, an author, and someone who really loves dessert. She’s the author of the novels Looks Like Love, The Romano Family Collection, and award-winning The Last Summer. Having worked in the publishing industry for more than a decade, Brandy currently works as a freelance book editor, when she’s not writing novels! Brandy, her husband, and their children make their home in the beautiful state of Colorado. She’s very active online and she loves to hear from readers. Sign up for Brandy’s newsletter via her blog! 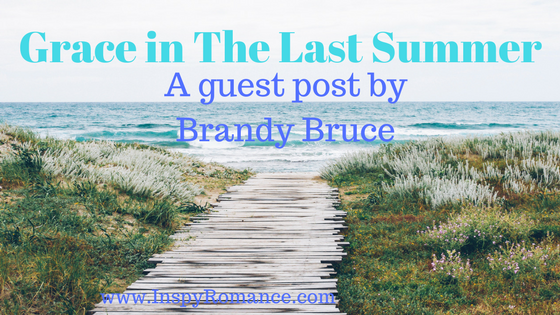 Brandy is going to give away one e-book copy of The Last Summer! To be entered, leave a comment. She’ll draw a winner on the 27th and it’ll be announced in the Sunday Edition. Thanks for your thoughts and the giveaway. Indeed, showing grace and accepting grace are very difficult, but something that has to be done daily…..
Minor tech issue. On the Amazon page, the book description stops at one incomplete line. I think there is a technical error. Claire! Amazon and my publisher are working on it! Thank you! A friend and I were just texting about grace a couple of days ago. It can be so hard at times to extend grace to others. Yet when we need it to be extended to us, we want it so badly. Sometimes I’m in awe of how much grace God has given me, yet sometimes I take it for granted. Thanks for the post, Brandy. We certainly are a broken people. Hi Elizabeth and Brandy! Thanks for your insightful words about grace and enticing us into your story The Last Summer. Enjoy being introduced to new authors and their works. Even though retired, Always wish for more reading time! Best wishes and enjoy your weekend. ” God be merciful to me a sinner” and He is! He gives us His Grace because of who He is –not because of what we have done. We see glimpses in our own lives such as you have said– when we become parents. It’s a hard concept to grasp but His Grace is sufficient! Jesus did it ALL! Thanks for an insightful post. Blessings. So excited about your book….I visited Amazon and saw the great comments! Think I will download it today! Grace – wow, we all need more of that! Both giving and receiving. Thanks for joining us today, Brandy! The book sounds intriguing! Thanks for sharing. It’s so true, even though hard to believe sometimes, that God loves us just as we are. I’m so thankful for his saving grace. Grace is an amazing gift from God! It is important to extend grace to others as well. Thanks for the reminder! Thanks for sharing about your new story. Welcome Brandy! I always find it interesting to hear writers talk about the process of revising and changing a story to make it the best it can be. 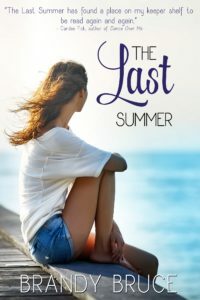 The Last Summer sounds like a great book. I love reading books with flawed characters because you see them learning life lessons & watch their faith grow! It helps me in my own walk with Christ :-) We all need grace because none of us is perfect. Thank goodness for God’s unconditional love for us! Thank you, INSPY, for having me today! And for all these delightful comments! I love hearing people talk about grace in their lives! I haven’t yet read any books by Brandy, but will check them out after reading this post. I especially loved her quote from her book: “We’re a broken people. That’s why the story of redemption reaches us at our core.” So true!